, a Greek philosopher and historian, was a native of Olinthus, and the disciple and relation of Aristotle, by whose advice he accompanied Alexander in his expeditions. Aristotle gave him to his scholar, that he might moderate the fury of his passions; but Callisthenes was too deficient in the arts of a courtier to render truth sufficiently palatable to the prince. His animadversions on him were probably conveyed in repulsive language, and he is said to have placed his writings far above the conquests of the king of Macedon, who ought, said he, “to look for immortality more from his books than from the madness of being the son of Jupiter/* He thus coarsely expostulated with Alexander on the absurdity of his expecting divine honours, and he became insupportable to the youthful hero. Callisthenes being accused, in the year 328 before the Christian aera, of conspiring against the life of Alexander, the prince eagerly seized that opportunity for getting rid of his censor.” This conqueror (says the historian Justin), irritated against the philosopher Callisthenes for boldly disapproving his resolution to make himself adored after the manner of the kings of Persia, pretended to believe that he had engaged in a conspiracy against him; and made use of this pretext for cruelly causing his lips, his nose, and his ears to be cut off. In this mutilated condition he had him drawn in his retinue, shut up with a dog in an iron cage, to make him an object of horror and affright to his army. Lysimachus, a disciple of this virtuous man, moved at beholding him languish in a misery he had brought on himself only by a laudable frankness, procured him poison, which at once delivered him from his exquisite torments and such unmerited indignity. 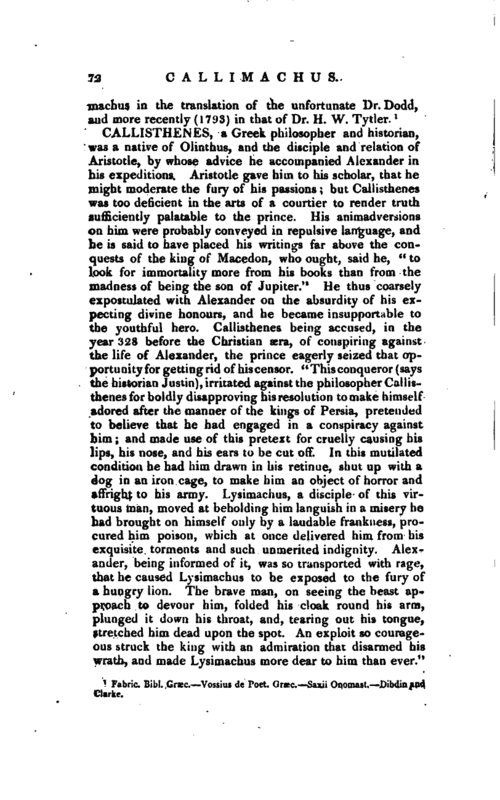 Alexander, being informed of it, was so transported with rage, that he caused Lysimachus to be exposed to the fury of a hungry lion, The brave man, on seeing the beast approach to devour him, folded his cloak round his arm, plunged it down his throat, and, tearing out his tongue, stretched him dead upon the spot. An exploit so courageous struck the king with an admiration that disarmed his wrath, and made Lysimachus more dear to him than ever.“ | There are, however, other accounts of his death, but all of them sufficiently shocking. It is reported that Alexander caused these words to be engraved on the tomb of Callisthenes:” Gdi Sophistam Qui Sibi Non Sapit." In the seventh volume of Memoirs of the academy of belles lettres of Paris may be seen some curious researches on the life and writings of this philosopher by the abbe Sevin. 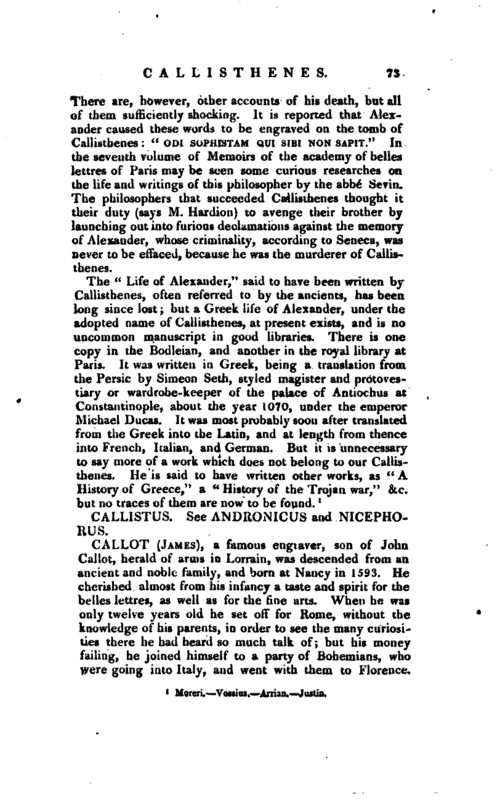 The philosophers that succeeded Callisthenes thought it their duty (says M. Hardion) to avenge their brother by launching out into furious declamations against the memory of Alexander, whose criminality, according to Seneca, was never to be effaced, because he was the murderer of Callisthenes.